The baroque console in silver wood with its mirror is made on a solid beech structure, dressed with fine sculptures, with a marble top and a mirror. 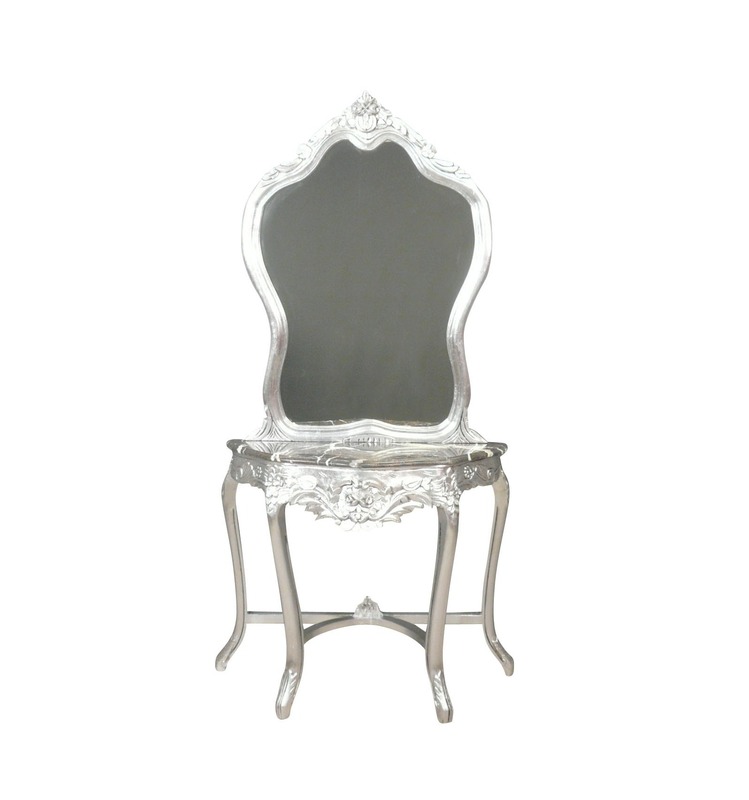 Made on a solid wooden structure of silver lacquered beech, carved with acanthus leaves and floral by hand, practical, elegant and solid, this Baroque console in silver wood with its mirror is a furnishing of the time. It has a marble tray to accommodate some belongings. Assemblies and finishes benefit from traditional techniques with tenons and mortises. Total height: 200 cm - Length: 100 cm - Height of the cabinet without the mirror: 84 cm - Depth: 43 cm. The consoles are kind of tables that are pressed against a wall, an ingenious combination with a storage cabinet. With their authentic and original appearance, they have an exhibition area to accommodate different objects and a large drawer to store others. What makes this antique furniture as useful as decorative. 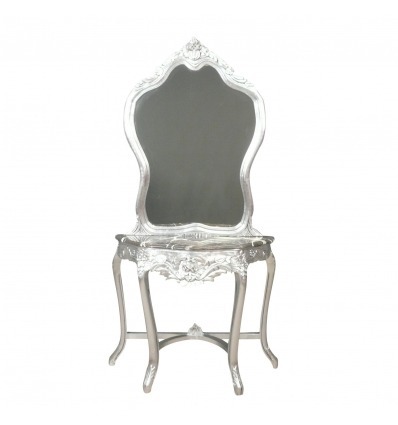 As elegant and luxurious, this beautiful Baroque console in silver wood with its mirror is antiques furniture perfect to make a leap in history while decorating your interior class. 200 cm high, this baroque console from another era is made mainly on a solid silver lacquered beech structure, dressed with fine sculptures of acanthus leaves and floral, handmade by hand for a few years.not flawless finish. Its black marble top with white veins combines perfectly with the silver-colored wood, to achieve an antique rendering. On the carved wood, silver aluminum foils are applied with a silk brush, the perfect finish gives the impression of a true work of ancient art. This precious wood and massive silver lacquered provides this console a look very chic and original for an antique rendering. As for assemblies, this furniture has exploited traditional techniques with tenons and mortises, a good compromise between aesthetics and robustness. With such furnishings, you will enjoy a harmonious and trendy decoration in your interior, resembling that of a castle or a palace. It is the very artistic ornamentation that makes the charm of this furniture. This is the reason why many important buildings, high society and noble families adopt this style to have a high-end decoration. This old console does not go unnoticed due to its elegant looks, its sumptuous forms and its very glamorous polishing finish. As part of the collection of antiquities, these baroque consoles, a style appeared around the sixteenth century in Venice and Rome, Italy, which later spread throughout Europe. This fashion has also touched a wide range of arts, such aspainting, music, architecture, music and especially furniture. It has evolved to be very popular and very popular throughout Eastern and Western Europe. In fact, the term "baroque" comes from "barroco", a Portuguese word that literally means "rare pearl". The antique furniture of this style puts forward exuberance, especially in baroque wood carving. The style took off in the seventeenth century in the influxes of the Renaissance, and inspired both artists of the time as the decorators. The console is a unique piece of craftsmanship. It is especially invented to add an atmosphere of elegant living and design in your home. Baroque furniture is characterized by its fine details, its solidity ensured by a spacer linking their feet, rounded curves and sculptures reminding you of the luxurious furniture of the time. This baroque console will fit perfectly in any type of decoration, be it baroque, classic, industrial or modern while delighting your guests. To enjoy even more ancient art, you will also have the opportunity to complete the decoration with other furniture of the same style.